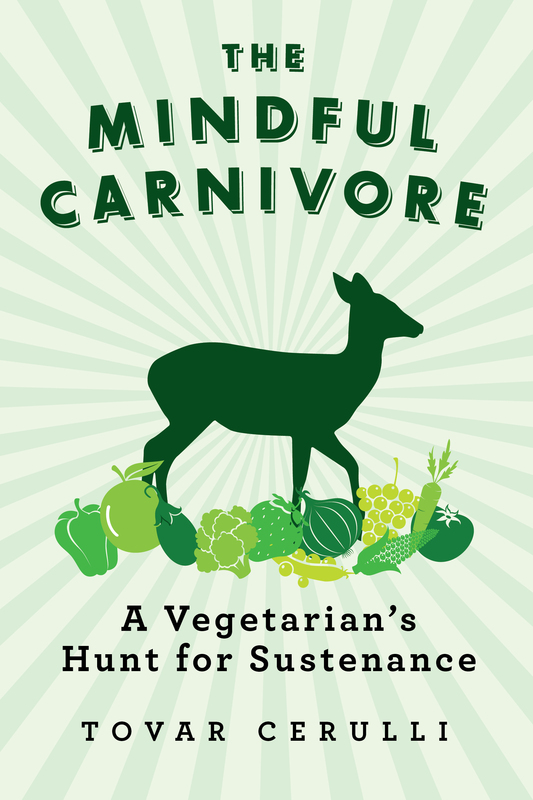 I’ve just finished Tovar Cerulli’s newly released The Mindful Carnivore: A Vegetarian’s Hunt for Sustenance , and I highly recommend it to just about anyone who eats and reads. No matter how you’d label yourself—hunter, nonhunter, antihunter, vegan, vegetarian, carnivore, or just an omnivore with dilemmas—this is a book worth reading. And once you’ve finished it, you may begin questioning those labels that once seemed so simple and clear. But apart from all the big ideas in this book, it’s just a good read. As Cerulli tells a deeply personal story of his own journey from vegan to hunter, he connects his experiences to larger themes having to do with meat, meaning, and the karmic costs of every food on his table—including the brown rice, tofu, and organic vegetables. As a few of you may already know, and as the rest of you will immediately guess from the book’s title and cover, Cerulli is now something of a venison evangelist. But he wasn’t always. After reflecting on the compassionate words of Buddhist teacher Thich Nhat Hanh, he became a vegetarian at age 20. Soon, after learning more about the modern egg and dairy industries, he went completely vegan. Eventually, however, he began to have second thoughts. Two years later, Cerulli picked up a rifle and stepped into the deer woods. When he did, he also brought with him a vegetarian’s values and sensibilities. This was not a decision he made lightly, and it’s one he still thinks about quite a lot. He is indeed a mindful carnivore. As far as I know, Cerulli is also the writer who first coined a delightful neologism that appears to be sticking: the “adult-onset hunter.” The term is appearing more often, and so are the hunters it describes. Cerulli is one, and I am myself. If you’re one, too, then this book is definitely for you. I suspect that most of us adult-onset hunters are the kind of people who tend to think just a little too much about where our food comes from. And even if you’ve been hunting all your life, you’ll find fascinating the ideas that Cerulli explores in The Mindful Carnivore. Today fewer than 15% of Americans hunt, and some surveys suggest that as few as 5% of us get out in the field regularly, year after year. Hunters are definitely a tiny minority. When they find themselves feeling besieged and persecuted, they’d do well to reach for some fresher, more useful intellectual and philosophical ammunition than the usual stale, warmed-over José Ortega y Gasset they’ve been trotting out for the past half-century or so. They could do no better than The Mindful Carnivore. I hope that even a few open-minded vegans will give this book a chance. But in the end, Tovar may find a larger audience among open-minded nonhunters who are already mindful omnivores. And who knows? Once they’ve finished reading The Mindful Carnivore, they may come to view hunters and hunting differently. They may even come to view the meat and vegetables on their own plates differently. I hope their neighbors who do hunt will invite them over for venison, vino, and some interesting conversations about what all this means. I have to agree with the Kirkus Reviews, which described the book as an “entertaining and erudite meditation.” It’s an enjoyable read that will also give you some big ideas to chew on. (Sorry.) I’m afraid other reviewers have already used this and nearly every other possible food or meat-related metaphor, leaving me only the most obvious: The Mindful Carnivore is definitely food for thought. The Mindful Carnivore is available online and at bookstores everywhere. If you’re into immediate gratification, you can buy it right now at Amazon . So… Who wants to go wolf hunting? Thanks, Al! I’m delighted that you enjoyed the book so thoroughly. You’re welcome! A good read, and sure to start some conversations.